Mormon Mommy Writers and Friends: What is ANWA? ANWA is a national writer's group for LDS women. I first found it in 2003 or 2004. I got information, but was scared off by the $20 a year dues. Spending money on my hobby would mean I was serious and then I might have to actually tell people I was writing. I chickened out. Now I realize if I had been courageous, I would have been in the ANWA chapter with the likes of Stephenie Meyer and Aprilynne Pike!! But I did find ANWA again later, in 2008 and haven't regretting a moment since! To tell you more about this wonderful group and to offer a FREE one year membership, is Marsha Ward, the founder of American Night Writer's Association. Marsha is also going to give away TWO of her e-books, The Owen Family Saga Sampler, AND the first book in the series, The Man from Shenandoah!!!! 1. Tell us about when you first started writing and a little about your writing journey. I've been a writer all my life. My sister tells me that when I was of pre-school age, I covered pages of notebook paper with scribbles and said it was my novel. I have no idea how I knew what a novel was. I do know I excelled at English and composition classes throughout my schooling. The teacher of the English class I took during my junior year of high school told me I should be teaching the class. Whoa! That blew me away. I began what became my first novel, The Man from Shenandoah, in 1965. At the time, my goal was to write “The Great American Novel.” Soon I had a manuscript of twenty chapters that I carted around with me for years, but I didn't seriously work on it again until the 1980s, when I began to consider sending work out to publishers. I'd been reading certain books and told myself I could write as well as any of their authors. I dusted off my “Great American Novel,” realized it was only a summary, then studied creative fiction writing with several teachers and through reading many instruction books. In the meantime, I started writing commercially for LDS newspapers, so feature and news articles were my thing for several years. After learning what commercial fiction writing really entailed, I began to hone what natural talent I had, and bit by bit, after throwing away a lot of chaff—such as too many characters—and adding the good stuff—like sensory details and emotions and actual plot—I had a manuscript to send out. That I did. I was getting good remarks from editors (but no offers yet), when I had a health crisis in 2002. It looked pretty bad. I wanted to leave my work behind in fixed form so no one would throw it out upon my death, so I looked into self-publishing. After some intensive study and thinking about what form of self-publishing I wanted to engage in, I chose to go with iUniverse. After a terrible false start on the cover, I provided them with a photo to use. I was so delighted with the quick turn-around and then the great response from readers, that I decided to use the same method of publishing for the follow-up novel, Ride to Raton. When word leaked out that my third novel, Trail of Storms, was finished at last, I was encouraged to submit it to a couple of publishers. I knew it wasn't right for them, but did so. I regretted wasting those eight months until rejection when a reader came up to me in a grocery store and begged for the new book. Why delay what clearly had a ready market? I went back to iUniverse for a third go-around. I've won national prizes for poetry, and published columns in several periodicals. I've also written chapters for non-fiction books on writing and publishing. All of my novels include romantic elements. There may come a time when I'll write a mystery. I had an epiphany several years ago when I realized that I write to let people know there is always hope, and to show them through the experiences of fictional characters that they can get through hard times, even really, really terrible times, and find happiness at the end of it all. One of the hallmarks of my fiction is fast-paced adventure peopled with believable characters. Readers tell me when they're forced to put a book down they worry about my characters until they can read about them again. If I can take people out of their own worrisome lives enough to be concerned about fictional folks and see them through to a satisfying ending, then I've done the job of relieving some of their day-to-day stress. Isn't that what books are for? 2. Can you tell us your early experiences with writing groups and what led you to start ANWA? As I began my serious writing journey, I attended several writing groups and clubs, including the oldest one in Mesa. It was a "slap-you-on-the-back-and-say-your-work-is-terrific" sort of club, and I quickly became disillusioned. I must have gone through six other clubs, including one where the reading content were so perverse that I almost gagged, and a Christian writing group, but I never felt entirely comfortable at any of them, and I wasn't learning much except on my own, by taking classes and online courses, and reading tons of books. Gradually, I renewed friendships with or made the acquaintance of five other LDS women who had writing aspirations. Then Heavenly Father slapped me upside the head and said, "Do something." I said, "Who, ME?" but got the six of us together, and after two hours together in a basement room of an old library building, we emerged as sisters in a writing group that came to be American Night Writers Association. Shepherding ANWA took over my time and my life. 3. Tell us what ANWA is and how it has changed over the years. ANWA, American Night Writers Association, Inc., is a network for LDS women writers of all types and levels of writing skills. In the early days, the six of us charter members met together in the break room of the Deseret Book store on Gilbert Road in Mesa, Arizona—not the one that exists today. It was across the street. When the store closed at night, we would stand around in the parking lot and discuss writing for at least another hour. We were so famished for a place where we could feel safe and connected by our beliefs. We called ourselves the East Valley Writers. Word started to trickle out about us, and more women joined. We began to meet in members' homes. Somehow, Marsha Beckstead (now Marsha Hanson), who lived in West Phoenix, heard about us, and traveled all the way to the East Valley to attend meetings. After a number of years, we split the East Valley group three ways, added Westside Stories Chapter, and changed the name to Arizona Night Writers Association. I became the first General President, with Marsha Beckstead as Vice President, and Patti Hulet as Secretary. Beulah Martin was the first Newsletter Editor. Gayla Wise organized our first writers conference, which was held in a business not far from Deseret Book. 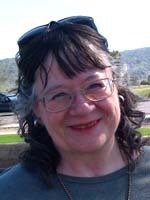 Charter member Peggy Shumway created our first website, and then ANWA exploded! Members joined from Ohio, Texas, Utah, and lots of other places, so we made the natural move of renaming the group American Night Writers Association. Chapters were formed in several states, and growth continued. Women came and went, as the tides of their lives ebbed and flowed. 4. How many chapters are there and where are they located? We currently have twenty-one chapters, with local chapters in Arizona, Utah, and Washington. They include a chapter for Young Women, and three online chapters that span the United States. Plans are in the works for a new chapter in the Tri-Cities area of Washington, in Flagstaff, Arizona, and in Texas. 5. How could one go about starting a chapter in their area? First, join ANWA. Go to http://anwa-lds.com and click on the link labeled "Join ANWA." Second, ask me for instructions and materials at membership AT anwa-lds DOT com, and get yourself appointed as the Chapter Leader, that is, the organizer. Third, find at least two other LDS women in the area who a) write or want to write, b) want to join ANWA, and c) want to meet together in a chapter. Fourth, hold an Organizational Meeting with the requisite minimum of three ANWA members; elect officers; set a regular day, time, and place to meet monthly; chose a chapter name (which will need approval to avoid duplication); and sign and submit pertinent paperwork. There are incentives for successfully organizing an ANWA chapter. Number one, you have an ANWA chapter in your area. Number two, if you organize a chapter within six months, and it meets regularly in a healthy state for at least six months, your dues for the next year will be waived. Number three, you'll be part of a growing network of LDS women writers where your love for writing is viewed as normal and acceptable. What about that is bad or unwanted? 6. Could you tell us how the online chapters work? Online chapters each have their own Yahoo Group as home base. There the members of the chapter upload the manuscript portions they want critiqued for the next meeting. The other members read ahead of time, then give highlights of their critiques during the online meeting, which is held for about an hour in a special chat room. Yes, you DO type the prayers, the lesson, the thought, and everything else. A special benefit of having the Yahoo Group is that the members can connect via email all month long. They don't have a regular, face-to-face two-hour meeting, so this is their trade-off. The secretary posts a transcript of the meeting to the Yahoo group, though, so members who didn't make the meeting can review it. All ANWA chapters have a president, vice president, and secretary, so there's no difference in that respect from local chapters. 7. How do you envision the future of ANWA? ANWA has finally incorporated, and we're seeking the okay of the IRS to be a 501(3)c operation. A new structure was approved recently, partly because I cannot keep wearing myself out in service to ANWA and write books, too. Now, four committees will do the work I used to do alone. This new structure enables ANWA, Inc., to expand it's reach to the entire world. Yes, every LDS women who writes or desires to write, whether for her family, community, or commercially, can join ANWA. The addition of the new Board of Directors and Regions will keep the work managable. 8. Can you tell us about the ANWA Writers Conference? 9. Tell us about your books and where we can find them. Actor Tom Sellack once said there should be a shelf in bookstores labeled "Darn Good Reads." I like to think my novels go there. My fiction works are historicals set in the 19th Century West. That broadly classifies them as Westerns, but if you think all Westerns are about outlaws and lawmen, or cowhands and sheep-herders, guess again. The Western genre has grown and evolved into many sub-genres, including my action/adventure/sweet romance novels dealing with Western Migration and post-Civil War angst. 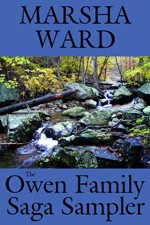 My three published novels have evolved into "The Owen Family Saga," with more to come. The Man from Shenandoah, featuring son Carl, introduces the series and the family in post-Civil War Virginia, and starts the group moving west. Ride to Raton tells the other side of the coin to Carl's happiness, as it details his brother James's travels to get away from an unhappy situation, and his growth through some really interesting events. Trail of Storms goes back to Virginia and brings neighbors of the Owen clan out of the beleaguered South. A stop on their trip to Albuquerque brings new turmoil into the life of Jessie Bingham, the protagonist. All three books are available in print at iUniverse.com, Amazon.com, Barnes & Noble.com, and other online booksellers, including mine at MarshaWard.com (autographed copies). Electronic versions may be found at Smashwords.com, BN.com, and all the Amazon Kindle stores. I also have various collections and short stories available as ebooks. 10. What is one piece of advice you would give to new writers? Do your homework and learn how to write well. Then don't be afraid to check out the freedom and almost instant readership being an independent self-publisher can give you. If you are the kind of writer who wants to connect with readers, you may want to do an end run around the very time-intensive and very limited traditional publishing world and check out the electronic and print self-publishing arena. If you are the kind of writer who needs the validation of gatekeepers and has plenty of time to spend chasing down an agent or a publisher, not so much. Over all, have faith in a bright future! 1. A FREE one year's membership to ANWA, or if you are ineligible for membership (a man, or not LDS, or already a member) you can receive $20 off of the fee to the ANWA Writer's Conference. 2. 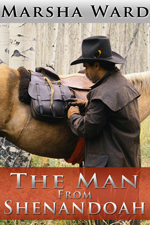 Two FREE e-books by Marsha Ward, The Owen Family Saga Sampler, AND the first book in the series, The Man from Shenandoah!!!! 1. You can earn an entry by asking a question about ANWA or the ANWA Writer's Conference. 2.You can earn an entry by being a follower or becoming a follower on MMW's blog/facebook page. Then leaving a comment on this post telling us. 3. You can earn an entry by advertising MMW's Blog Anniverary Giveaway Extravaganza on your blog or facebook page. Then leave a comment below letting us know you have done so. There you have it!! One of our best prizes so far! I say that because any published author will tell you, you are only as good as your writer's group. So be courageous and join or start a chapter NOW!! There IS a Davis County Chapter. I'm not sure how far north they meet, but contact me at membership AT anwa-lds DOT com, and I'll get you connected with the president. By the way, you can follow me at my blog. Just click the link below. I am an ANWA zealot! I had three novels already published when I joined ANWA, but I have learned so much about the craft since joining that I wish I had known about them years ago. Thanks, Liz! We learn a tremendous lot from you, and it's not all writing info. You're such a gracious and generous soul. Thanks for sharing! I'm already a follower here and of Marsha's blog. ANWA is the best! It has inspired me and taught me so much! Very grateful thanks to you, Marsha! You're quite welcome, Valerie. I'm sure if I hadn't done something for LDS women writers, Heavenly Father would have motivated someone else to get it done. But I did, and ANWA IS the best! All the members and leaders have made it terrific, and that includes YOU! Thank you for starting ANWA, Marsha! I've been a member for many years. I wish I could say I was part from the beginning, but alas, Twenty years now? I've enjoyed each of your books and look forward to the next. Go, Marsha! Thank you, Joan. And what a valuable member you've been! ANWA's fundamental policy that the membership is restricted to women members of The Church of Jesus Christ of Latter-day Saints who write, have a desire to write, or fall somewhere in between, came from the very beginnings of the organization. Six women met together. We bonded. As membership grew, some members were fragile. They needed a safe haven, a place where they could share their writing and hearts with other women. That worked for us and for the organization, and it still works today. We don't hate or diminish men. The majority of us have been or are married, but we also have a beloved minority among us of those who have never received the blessing of marriage. Some of us grew up branded or self-proclaimed as tomboys, myself included. Nowadays society recognizes that many old traditions in children's play have melted away, and encourages more diversity in activities. I'm not saying perversity is okay. I'm saying martial arts and active sports participation and many other so-called "male" activities are fine pursuits for female children and adults these days, and no one brands them as tomboys anymore. I wasn't harmed by being a tomboy and dreaming of riding horses and living in remote cabins in the woods (which I acted out with stick horses and home-made forts). I had a happy marriage until my husband's untimely death. That's okay. It's eternal. I write Western fiction, mainly from a man's point of view, but my current WIP is written from the POV of a young women. I don't have any problem relating to other members of ANWA. How do you find out if there is a chapter in your area and if there isn't how do you start one? I've wanted to join ANWA for a few years now but never found where in Utah County they meet. I guess I'd better get a move on it! I didn't realize how much you were involved in ANWA, Marsha. This was a great and informative post. THANKS! To find out if there is a chapter in your area, click here, which goes to the "About Us" link at the ANWA website. Hi Taffy! Yes, we do need to meet. And thanks. I'm glad the interview was so helpful. The Utah County chapter, Wasatch Writers (not the chapter of LUW with the same name), will be meeting in Provo now. We just split the chapter so the members in Salt Lake County won't have to travel so far. When they meet together in February, they'll choose their name. Wonder what you girls have against Mormon granddaddies. Hmmmph. Marsha, I'll try to get up Payson way when I go to WWA in June. I'll go see my brothers and daughter in Mesa and take a run up over the Mogollon to Show Low. Sorry, I don't write Mormon books, but many of my books have Mormons in them. Hang in there. Hey Charlie, I plan to see you in Albuquerque! Members of ANWA don't only write Mormon books. Our President-elect, Janette Rallison, has sold over 1 million copies of her books, mostly YA fiction in the national marketplace. It was great reading about the very beginning of ANWA. I joined the Moonwriting Chapter because weeknights are really hard for me to meet. Moonwriting meets online during the day, once a month. Marsha is the glue that has held ANWA together for over two decades. She is a living example of serving others! Thanks, Marsha! I too belong to ANWA for a few years now. Best place on earth. I have learn so much with all my ANWA friends is incredible. Marsha you have a great writers career behind you and a better one in front. You are an amazing person. Hugs. Author of "The Silent Warrior Trilogy"
Thank you, Heather, Janette, and Anna. ANWA is the best place on earth.